Fast becoming a hot zone for development and progress, Andhra Pradesh is coming up with major economic and infrastructure projects after the bifurcation. The state has been making massive progress and there have been significant developments across the board particularly in the Justice, Governance, Sports, Finance, Education and Knowledge, Health, Media, Electronics, and, Tourism sectors. These developments present unique and worthwhile opportunities that are unprecedented in recent times. In this backdrop and with regards to the future potential and opportunities for the justice sector, Centre for Strategy and Leadership is organising a workshop titled “Andhra Pradesh: Building the Nation’s First Justice City” in association with the Andhra Pradesh Capital Region Development Authority (APCRDA), Government of Andhra Pradesh. The workshop will focus on Andhra Pradesh’s legal infrastructure and ecosystem, various initiatives of equality in law and justice and the building of the upcoming Justice City in the state's new capital city of Amaravati. The session is from 3.30pm - 6.00 pm followed by High Tea on Tuesday, October 30, 2018, at Annexe, Constitution Club of India, Rafi Marg, New Delhi. 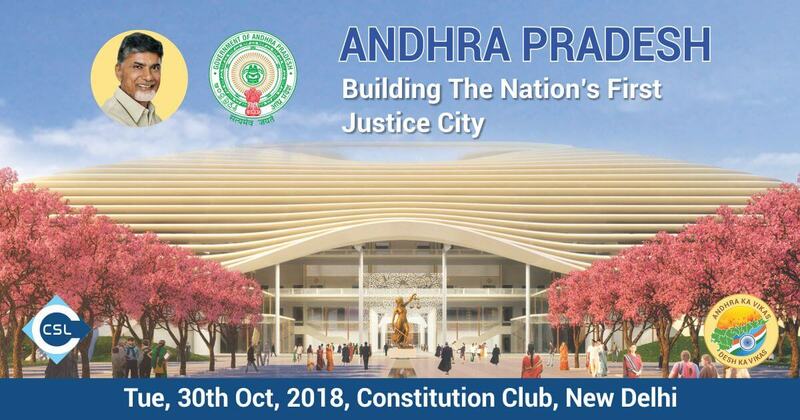 This workshop presents an excellent opportunity for representatives of the justice sector to learn about the upcoming Justice City in Andhra Pradesh as well as the major projects, upcoming and underway, that are aimed at strengthening the Judicial Infrastructure in Andhra Pradesh. This workshop is also a platform for the participants to put forth their ideas and recommendations. Those wishing to participate in this workshop and gain invaluable knowledge and perspective on the topic may submit their request for participation by filling up the participation form. Any queries, clarifications and information can be addressed to Ms Raksha Sharma, Manager (email: raksha@cslonline.org, mobile: 9212129276).